IQ tests are routinely encountered in recruitment for various industries, including for jobs in the government, armed forces, and education as well as industry and commerce. Competition is fierce and employers are determined to cut the weak from the strong so it is essential for candidates to be prepared. Ultimate IQ Tests is the biggest book of IQ practice tests available. 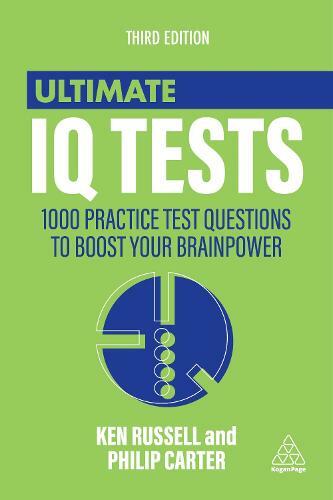 Written and compiled by experts in IQ testing and brain puzzles, it contains 1000 practice questions organized into 25 tests, with a simple guide to assessing individual performance. With a brand new test in this edition, designed to be more challenging than the others so you can track progress, this is the best one-stop resource to mind puzzles. Working through the questions will help you to improve your vocabulary and develop powers of calculation and logical reasoning. From the best-selling Ultimate series, Ultimate IQ Tests is an invaluable resource if you have to take an IQ test, but it's also great fun if you like to stretch your mind for your own entertainment - and boost your brain power.